Comprehensive list of books recommended by the Association of Child Life Professionals, including resources in Spanish. Everett Anderson's Goodbye - written by Lucille Clifton for elementary age children journeys with a young boy and his mother as he grieves his father's death. Everett Anderson's Goodbye is the winner of the 1984 Coretta Scott King Author Award. A simple beautiful telling of a girl's relationship with her Grandmother before and after the grandmother dies. The book emphasizes Chinese traditions but is accessible to all cultures. The Memory Box: A Book About Grief by Joanna Rowland. From the perspective of a young child, Joanna Rowland artfully describes what it is like to remember and grieve a loved one who has died. The child in the story creates a memory box to keep mementos and written memories of the loved one, to help in the grieving process. The unique point of view allows the reader to imagine the loss of any they have loved - a friend, family member, or even a pet. A parent guide in the back includes information from a Christian perspective on helping children manage the complex and difficult emotions they feel when they lose someone they love, as well as suggestions on how to create their own memory box. 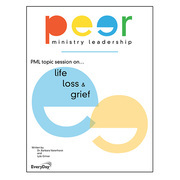 Resource for discussing life, loss and grief by Peer Ministry Leadership. 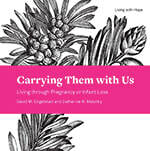 Carrying Them with Us: Living through Pregnancy or Infant Loss by Luther Seminary Grant and Project Manager Catherine Malotky, co-authored with David M. Engelstad, offers a reflection on what these two authors experienced after the death of their eight-week-old daughter. Talking to Children about Death - Fred Rogers (Mr. Rogers) legacy lives on in these resources for children. In particular, here are some helpful tools to talk to kids about death. Grieving Students Website - purpose is to create and share a set of industry-endorsed resources that will empower school communities across America in the ongoing support of their grieving students. Care in the Classroom for Grieving Children - An NPR story that brings to light the need for care for children with grief. Could be helpful for the church as well. The Grieving Child - by Helen Fitzgerald goes through the details of all the practical things to think about when raising a child who has had a loved one die. The Grieving Teen - by Helen Fitzgerald goes through practical aspects of helping teens who have lost a loved one. Swallowed By a Snake: The Gift of the Masculine Side of Healing - by Thomas R. Golden for high school youth or grieving parents, explores the variety of ways people grieve. Something Very Sad Happened: A Toddler's Guide to Understanding Death - a useful tool for parents, caregivers, therapists, and teachers to help young children understand the concept of death and begin the process of coping with the loss. Intended for children ages 2 and 3, the book explains death and loss to a very young child in a simple and age-appropriate way. Includes a "Reader's Note" and "Note to Parents, Caregivers, and Therapists" written by the author, Bonnie Zucker and illustrated by Kim Fleming. Healing After Loss: Daily Meditations for Working Through Grief - by Martha Whitmore Hickman is best for High School youth or grieving parents.